If you're planning a trip to Naples, Florida make sure you take the time to visit the Naples Zoo at Caribbean Gardens located at 1590 Goodlette-Frank Road. The zoo is very family friendly and has something for ages 1 to 100! The Naples Zoo at Caribbean Gardens is a totally unique experience. A paved path (which is roomy enough for those of you who are pushing a stroller) winds nearly a mile past rare and beautiful animals, exotic plants, tropical gardens, and more! All the animals appear well cared for and each have plenty of room in their environment to play, relax and socialize. "All of our keepers have a relationship with the animals and the animals are enriched by it. The animals are visited and played with every day," Pam Krol, the Director of Development and Marketing for the Naples Zoo told us. Each day from 10:00AM to 4:00PM, the zoo offers several "Meet the Keeper" shows which are an opportunity for visitors to speak with the keepers and learn about the animals in their care. The keepers are friendly, outgoing and have a vast knowledge about these animals. Visitors are encouraged to ask questions during these shows. While walking through the zoo, be sure to stop by the giraffe exhibit. For just a few dollars you can feed a giraffe right out of your hand! All ages are welcome to participate and it is a great photo opportunity. 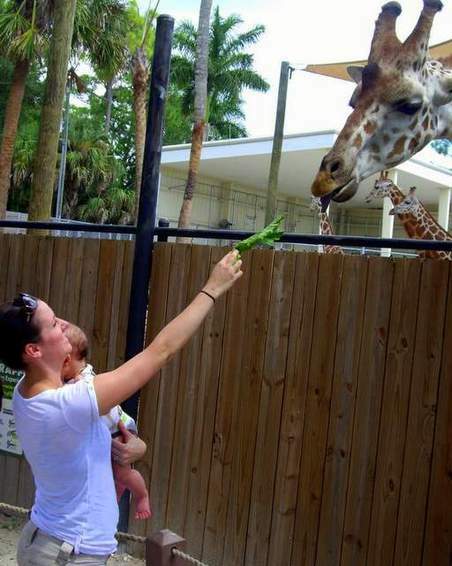 My husband and I were given 3 lettuce leaves to share and we both were able to take photos of this experience; I even fed a giraffe while holding my 3 month old son! It was definitely the highlight of our trip. After you're finished feeding the giraffes, head to the Cruise Dock for the Primate Expedition Cruise on Lake Victoria, where you will ride past islands where monkeys, apes and lemurs reside. Upon seeing our covered boat, some monkeys came to the edge of their island to show off their swinging & flipping skills! If the adults need to rest their feet, the zoo has plenty of benches around the park, several snack & beverage huts and there are even three play areas where the kids can run free while the adults take a break. Lastly, make sure you catch the Feature Show in Safari Canyon Open-Air Theater before you leave! The show is an excellent way to finish a fun day. Their website describes it best, "Live animals do natural behaviors plus wildlife video & live camera action!"